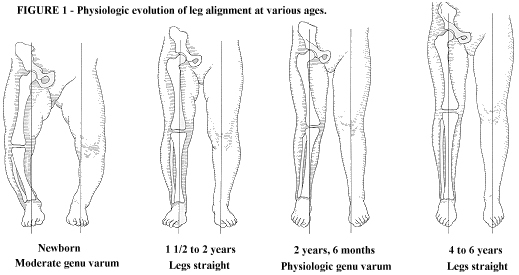 Physiological genu varum is normal in infants and maximal at 6 months of age, then they progress to excessive genu valgum (knock knees) followed by gradual correction to the normal adult valgus alignment by 5-6 years of age. It is caused by the natural development of the tibial-femoral angle. See figure below. Figure 1: The natural history of the tibial femoral angle is one of considerable genu varum or bowing at birth, approximately 15 degrees. There is gradual spontaneous correction to zero degrees at one and one-half to two years of age. During the next year, a valgus of 10 degrees to 12 degrees develops which gradually corrects to the normal adult value of 5 to 6 degrees valgus at about age seven years. This process is identical in boys and girls. None. They generally will resolve spontaneously and require no treatment. Corrections, splints and exercise programs do not produce any change different than the normal expected spontaneous correction. Moreover, may lead to hazardous complications. Factors suggestive of pathologic conditions include failure of genu varum to correct by age two years, increasing deformity, unilateral bowleg, and a marked lateral thrust with weight bearing. Condition is associated with pain.